The Groundhog Fusion Mobile range is the latest concept in 12 volt technology delivering cost effective and environmentally efficient, robust and easy to use ground lowering, anti-vandal, site accommodation. The Fusion Mobile offers the legendary robust and ease of use of the standard Groundhog GP360 whilst offering a green environmental solution. This gives end users savings by way of reduced fuel usage, 60% reduction in generator servicing, longer generator life, fewer breakdowns and massively reduced noise pollution. 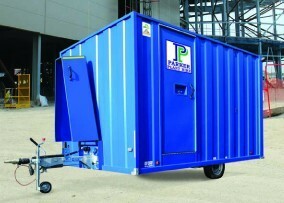 Suitable for accommodating six persons, which provides pleasant and safe working environments. Easily towed, one man operation secured and manouvered on site, in less than 3 minutes. Warm water supplied by an on-board heater system. 12V - 230V Inverter powered socket - provides 20 amp 12 volt power suitable for charging mobile phones and laptops.